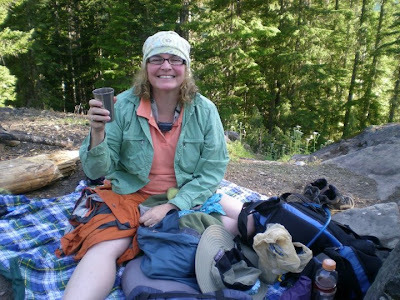 I helped install this water bar in 2007.
during my thru-hike of 2010. So I snuggled comfortably in my sleeping bag and as the morning mosquitoes got going, I would throw a shirt or jacket over my head to keep them at bay. 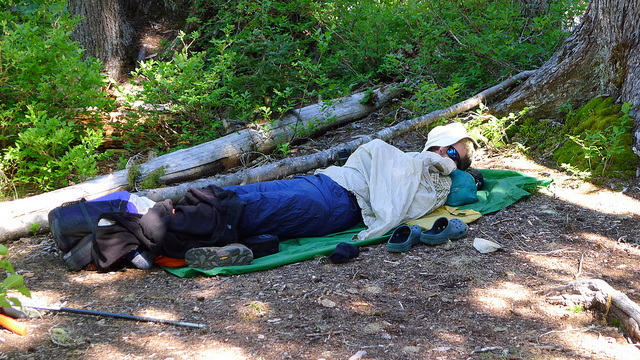 One of the downsides of camping without a tent! Eventually, though, I actually got up and started moving. It was a beautiful morning too! Each of the smaller teams left as they got ready, and I headed out with the rest of Team Buzzsaw passing a couple of teams that had already stopped to log out some trees blocking the path. We passed on old water bar that I helped install back in 2007. It's easy to identify because it's the only water bar between Lemah Meadows and Solo Tarn, so I took photos of it to compare later with the photos back from 2007 and more that I took during my PCT thru-hike of 2010. View from the avalanche shoot. A couple of days later, a park ranger--John--would meet up with our group and tell us a little about this avalanche shoot because he was working the area back when it happened. The small clearing, back in the day, used to be a vibrant, thriving forest until an avalanche punched through sometime in the early 1990s. 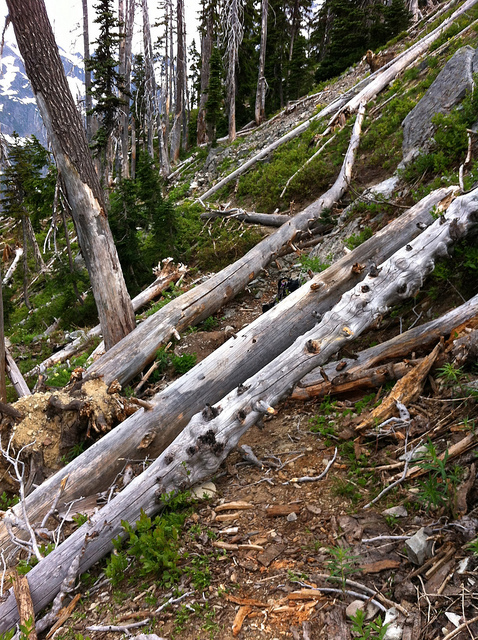 Apparently, it left the trail quite a mess with hundreds of trees stacked and piled high. John said he's a little disappointed that you can't see the awesome destruction of the avalanche anymore. 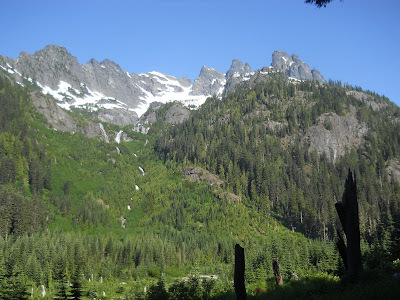 The trees have largely rotted and those that are left are covered with brush and vine maple that hide the incredible, destructive powers of the avalanche. 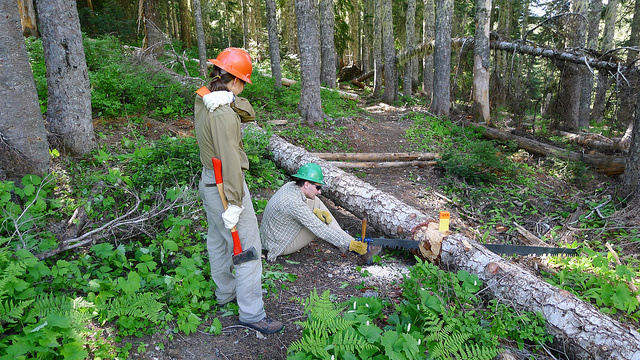 Many thought they'd need to get an exception to the "no chainsaws" rule in wilderness areas, but they sent a team out with cross-cut saws and it took them a solid week to clear the section of trail, not even a tenth of a mile long, through the rubble. 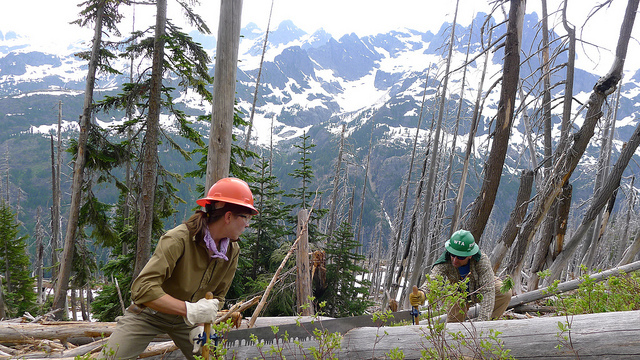 We shed our packs, put on the required hard hat and gloves. 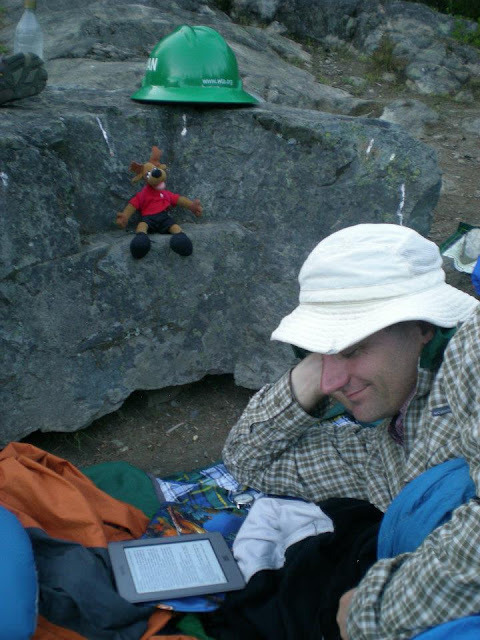 Also required: a long-sleeved shirt, long pants, and boots, but we already wore those on the hike up. Step 1: Examine the tree and surroundings. Logging out a tree is pretty simple in theory. Step one: we examine the blowdown. We walk around it noting stuff like if it's root ball is still attached to the ground (if it's not, it's much more likely to slide down a steep hill or roll over and hurt someone). We look up to see if there are any dangers overhead that might rain down on us as we do our work. 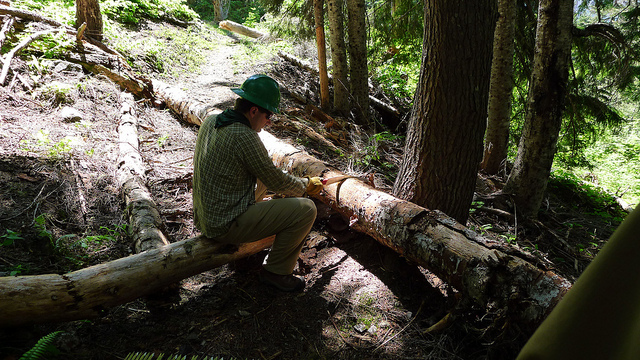 We look for tension and compression on the tree to identify the best places to make our cuts. In areas of compression, the saws can (and do!) get stuck as the wood pinches the saw blades. Getting a saw stuck is a huge hassle--and if it's bad enough, it might even require us to get help from another team to saw out our own saw. So we want to avoid that. So we all walk around the tree, looking for dangers and form a plan of attack. Then we moved on to step two: cut away all of the small branches and stobs sticking out from the main trunk. They make logs hard to roll. Sometimes, this is a good thing when we want to make sure that a log doesn't roll onto one of us, but in this case, on the relatively flat terrain of this area, they would just get in our ways. So we took out our Corona handsaws and lopped all of those branches and stobs off. Now we just had the big trunk blocking the trail, and we decided to cut it out with two cuts--one on each side of the trail. Larry worked on knocking off a lot of the bark with dirt at the cut. Dirt will clog and dull a sharp cross-cut saw faster than you can believe, so we already tried to "clean" the cut first by knocking off the bark where the dirt would be. Step 2: Get rid of all the branches and stobs. We also used loppers to cut down some of the vegetation near the cut. The loppers turned out to be incredible useful for this purpose over and over again. The vegetation would grow low, near the ground, where were were trying to cut and get in our way, so we'd lop it away to make room for our work. And Marcella took the honors of doing the cut with the cross-cut saw. In hindsight, it probably would have been easier had we put handles on both ends of the cross-cut saw and had two people saw, but we didn't and suffered as a result. The log was suspended over the trail meaning that the compression was on top of the log, and sure enough, the saw started binding as it got deeper into the cut. Eventually, we started underbucking--which is absolutely exhausting and not fun at all. With a cross-cut saw, the bulk of the effort goes into pushing the saw back and forth and gravity pulls the saw down to do the actual cutting. Cutting under the log meant that not only was gravity not helping, but was actively working against you. Step 3: Clear the cut of dirt. Larry does that here. Eventually, though, we managed to cut through the log. 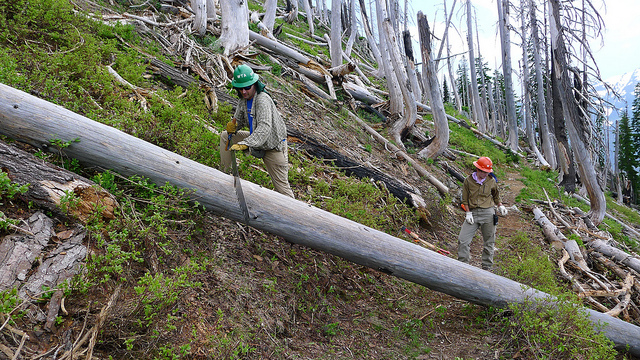 Along the way, another team caught up with us and decided to take out the smaller log we had skipped. They took it out and passed us while were still working on our first cut. I was put in charge of the second cut which went marginally easier than the first cut, but not by a whole lot. Finally the cut was made and I was ready to finally push that hunk of log off the trail before Larry stopped me. "You want to get a picture of your cut first?" So I took a couple of photos then we all got behind the log and pushed it off the trail. We headed up the trail in search of other logs blocking the trail. 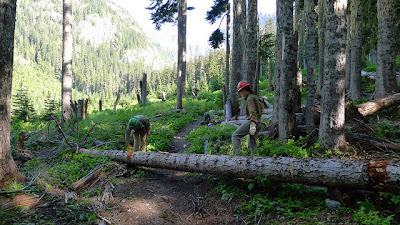 We passed other recently cut logs--obviously work from the teams ahead of us--then finally passed the other teams to take the lead where we finally found some more trees blocking the trail. Step 4: Cut! Go, Marcella! Go! I wasn't sure how many trees the other teams logged out, and none of the others seemed interested in counting. Some of our trees were challenges that took significant amount of time and effort to get through while others were relatively quick and easy to dispose of, but for the day, our total stood at 7 1/2. Assuming the other three teams did about the same (and honestly, I have no idea if they did or didn't), that would mean our group collectively cut out 30 trees that day. Awesome! I start clearing dirt and bark from our second cut. We stashed our tools off on the side of the trail--no sense in carrying them all back down to camp just to carry them back up the trail the next morning. 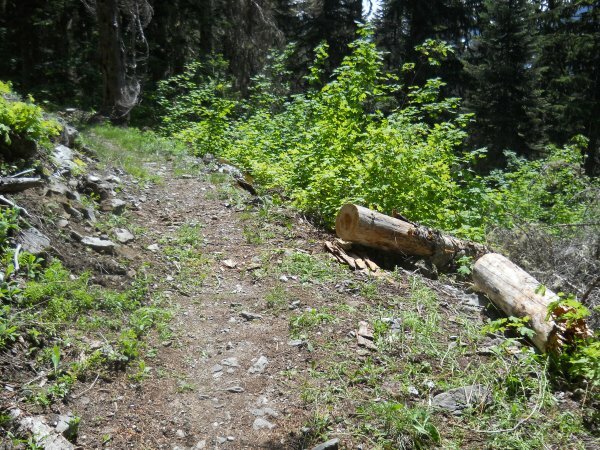 I did keep my handsaw, though, so I could cut down a couple of smaller branches that poked out into the trail but technically didn't block it for hikers. 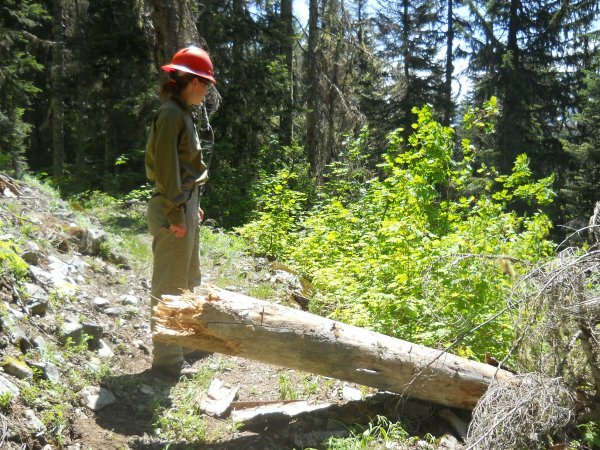 The PCT is a horse trail so a few of the logs that fell wouldn't have blocked hikers at all, but they might have caused issues for pack animals carrying large loads. They were generally small, though, and I figured I'd hit them with the handsaw on my way back to camp. 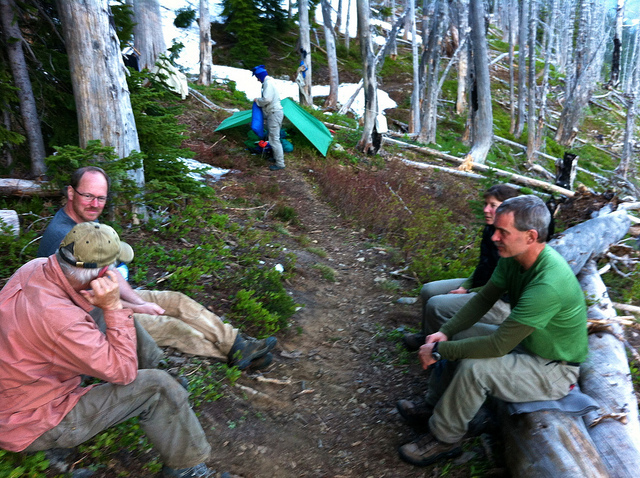 The grub-hoe, cross-cut saw, loppers, and our axe stayed where we cut our last tree for the day, though. to help make it easier to push the big log off the trail. Our job here is done. Time to move up to another log! sitting on, and the log I'm sitting on is kind of in the way of the log on the left. Marcella examines this tree sticking out into the trail. And another reminder--the Washington Trails Association is warming up for another Hike-a-Thon, and we'd very much appreciate it if you could sponsor Amanda and myself this year! Your contributions to towards supporting work parties just like this one, preserving and maintaining trails around Washington state.